BFREE’s new film, Wings of Hope, was released on YouTube in August. The 20-minute documentary chronicles the re-discovery of a population of wild Harpy Eagles in the Maya Mountains of southern Belize. The film showcases the history of the BFREE and University of North Carolina, Wilmington initiative born from this discovery – the Integrated Community-based Harpy Eagle and Avian Conservation Program. Created by Emmy-award winning filmmakers, Richard and Carol Foster of Wildlife Film Productions, and narrated by Jacob Marlin, this film is rich with breath-taking footage of adult and juvenile Harpy eagles and other wildlife and vistas found in the pristine tropical forests of the Bladen Nature Reserve. Over the seven year duration of the project, the Fosters followed project trainees William Garcia, Liberato Pop, Alejandro Cholum and Thomas Pop as they work to learn about and attempt to save this rare bird and its diminishing habitat. “The story captures the essence of BFREE’s mission. I think of it as a model for integrating science, education and conservation.” Jacob Marlin, Executive Director of BFREE. In August the film was posted to YouTube – watch it here – and in early September 2015, the film was shown in fourteen schools and community centers throughout southern Belize in order to raise awareness of the significance of continuing to protect wilderness areas like the Bladen Nature Reserve and the greater Maya Mountains. The film has also been submitted to Cinema Verde, an international environmental film and arts festival in the U.S.A. and we hope to submit it to the 2016 Belize Film Festival. 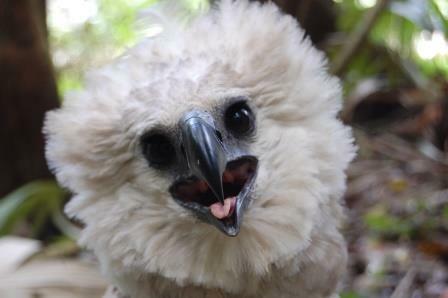 Dr. James Rotenberg of UNCW and BFREE staff members published an associated article in The Wilson Journal of Ornithology detailing the finding of the first record of a Harpy Eagle Nest in Belize. Congrats Jacob. I was in BFREE over 911. It is Awesome..